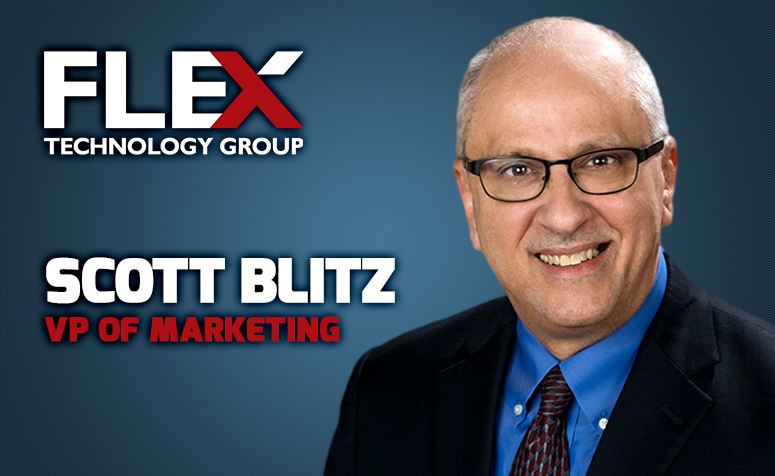 PHOENIX, November 8, 2018	(Newswire.com) - Flex Technology Group (FTG) has announced the expansion of its executive team with the addition of Scott Blitz as Vice President of Marketing. This addition to FTG’s executive team comes at a time when the company is experiencing hypergrowth and aggressively expanding across the country. Scott will support FTG’s ongoing growth and scale by forging closer relationships with our OEM partners and managing the brand across the country. “Our vendor partners are critical to our growth, and one of Scott’s primary areas of responsibility will be to work with them to ensure we are maximizing their capabilities so that Flex Technology Group provides the highest possible service wrapped around the best product portfolio for our customers," said Tom Callinan, President of Flex Technology Group. Scott brings to FTG more than 25 years of industry leadership having previously served as the president of Global Imaging System’s Arizona Office Technologies (AOT), a Xerox subsidiary. Prior to his time at AOT, Scott was a regional sales manager for Sharp Electronics and an area sales manager at Danka Office Imaging, subsequently acquired by Konica Minolta. Flex Technology Group provides customized office technology solutions for national and leading-edge regional companies. The company focuses on print, document management, document production and managed IT solutions, representing industry-leading suppliers such as Canon, Ricoh, Konica Minolta, HP, Lexmark, and various software solutions. FTG services almost 20,000 customers nationally. For additional information, please visit www.FlexTG.com. We are committed to adding increased and measurable value to you at all times. Flo-Tech wins the prestigious Chairman's Award and is crowned Flex Technology Group's company of the year.